At the end of last month, I got some new yarn. 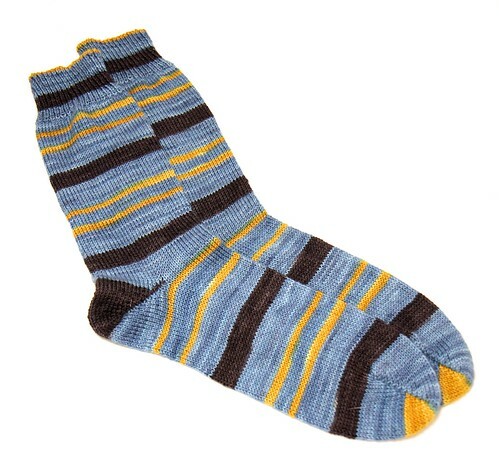 This week, I finished making them in to socks! This is probably the fastest from-purchase-to-use cycle I've ever had excluding yarn I've had to buy to finish up a project already in progress. And, even more surprising perhaps, these are for Dan! The yarn's colorway is called 'Live Long and Prosper' and it is a special edition Turtlepurl yarn dyed in remembrance of Leonard Nimoy. So naturally (logically), these are now Dan's Spock socks. And pair five for 2015. Thank you! Dan wore them to work yesterday and had nothing but good things to say about the feel. Yay!